Are you struggling to quit smoking? Have you tried using nicotine patches, gum, e-cigarettes, medications etc., but still had no success quitting? You can successfully stop smoking now! Even if you haven’t succeeded before. You can successfully stop smoking now! Even if you haven’t succeeded before. 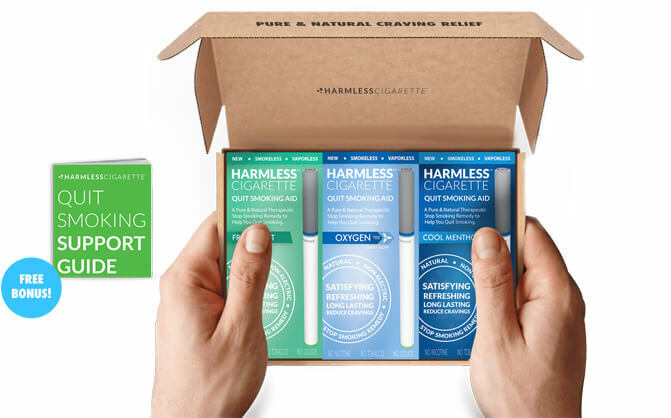 Harmless Cigarette promotes various natural quit smoking remedies that can help reduce cravings, overcome the urge to smoke, satisfy oral fixation and help make quitting easier so you can successfully stop smoking for good and begin your new smoke-free life! 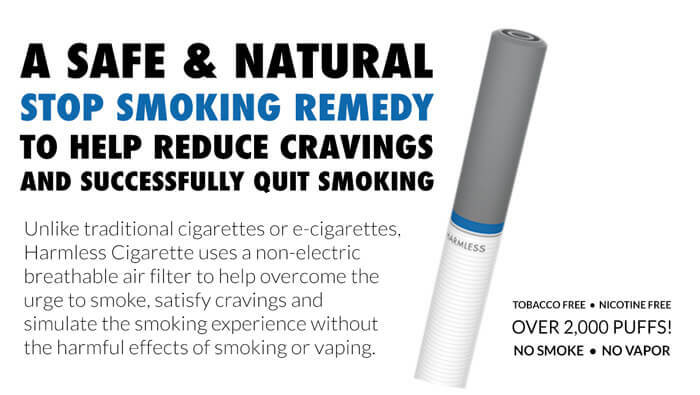 Harmless Cigarette is a therapeutic habit replacement which replicates similar features of a real cigarette combined with natural detox remedies that can help satisfy cravings, overcome the urge to smoke and help smokers successfully quit or replace smoking naturally without the harmful effects of smoking, vaping or using nicotine products. Harmless Cigarette is NOT an E-cigarette. It’s 100% non-electric, smokeless and vaporless. It does not contain any nicotine or tobacco. It's completely free of any artificial flavors, unwanted chemicals and addictive ingredients like those found in tobacco cigarettes, e-cigarettes and nicotine products. Harmless Cigarette feels and looks like a real cigarette. It's conveniently small and lightweight which makes it extremely easy for you to take with you anywhere so you can hold or puff on and overcome cravings anytime you feel like smoking. You don’t light it and you don’t charge it. No smoke or vapor is inhaled or exhaled, and it can be used anytime, anywhere, including non-smoking areas! Harmless Cigarette focuses on satisfying both the psychological & physical “hand to mouth” addiction which most smokers find difficult to overcome when quitting. It uses a proprietary non-electric breathable air filter available in several different options which are popular for soothing and coping with quit smoking systems. Most cravings only last a few minutes. Harmless Cigarette is designed to help buffer out those cravings so you can create some space to rethink if you really want to smoke and helps you get through those few minutes without giving in to the destructive urge. Each variant offers a unique experience. The Harmless Cigarette Oxygen variant is inherently the safest quit smoking alternative that can be used by anyone. Since it's 100% pure and natural and completely free of any aroma. It uses the proprietary non-electric breathable air filter that's designed to help make it easy to breathe clean fresh air and overcome cravings naturally by practicing breathing exercises. The Harmless Cigarette aromatic air filter options are infused with pure and natural essential oil blends which have been used for centuries to help improve various health conditions, calm the mind, ease cravings, reduce stress and promote feelings of relaxation. Many former smokers that successfully stopped smoking using the Harmless Cigarette quit smoking method have found it to be extremely helpful and useful for quitting. The Harmless Cigarette 4-6 week Quit Kit includes all the necessary items and resources you will need to help and support you on your quit journey. With willpower, commitment and the strength of Harmless Cigarette it’s possible to stop smoking for good, and retrain yourself to overcome the urge to smoke so you can successfully quit and become smoke-free for life. Harmless Cigarette will not become another substance you are dependent on but rather a helping hand as you break your unwanted habits. The Quit Kit is designed to help smokers quit within 4-6 weeks when used properly in accordance with all the product instructions and information. Although everyone is unique and may experience results sooner than others, success will ultimately depend on your commitment to quitting. Many customers who quit using Harmless Cigarette say they’ve been able to quit much sooner and for some, it took them a little longer. But for best results, it’s recommended to continue using Harmless Cigarette until you don’t feel any more cravings to smoke and finally feel you have successfully quit. To enjoy the most pleasant experience and to ensure highest success rates it’s important to always use Harmless Cigarette as directed, follow all product details, instructions, and recommendations which are included in the Quit Kit package. A single Harmless Cigarette can last 2,000 puffs or more depending on how often it’s used. Many former smokers that quit using Harmless Cigarette say it lasted 1-2 weeks at a time for them with regular use. For best results, it's recommended to use a new Harmless Cigarette at least once a week or as often as you feel necessary until you finally successfully quit smoking. Harmless Cigarette is inherently a healthier and safer alternative to smoking, vaping or using nicotine products. It's a great solution which can be used as a replacement for smoking tobacco cigarettes, using e-cigarettes or nicotine products. 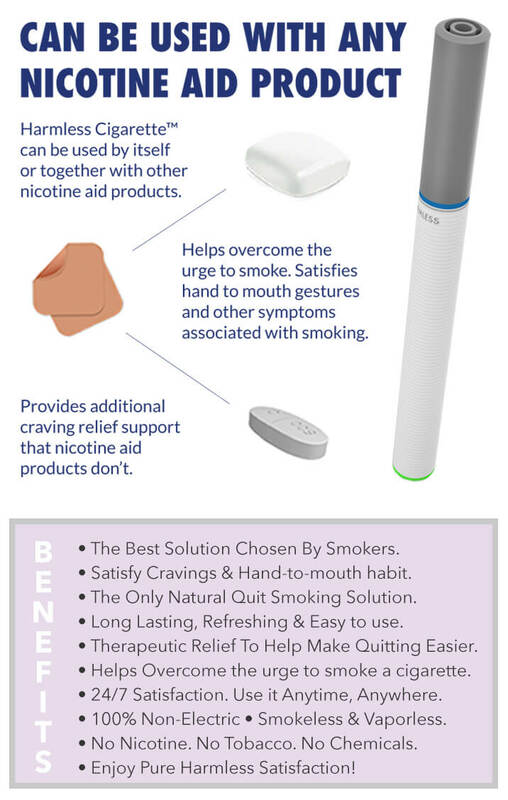 In addition, Harmless Cigarette can be used by itself or in conjunction with NRT products and medication to help focus on satisfying the psychological & physical “hand to mouth” addiction which most smokers find difficult to overcome when quitting smoking. Since Harmless Cigarette is simply pure and natural and does not contain nicotine or any addictive chemicals it will not interfere with other products. Many former smokers say they found Harmless Cigarette to be extremely helpful and useful when used together with NRT products. 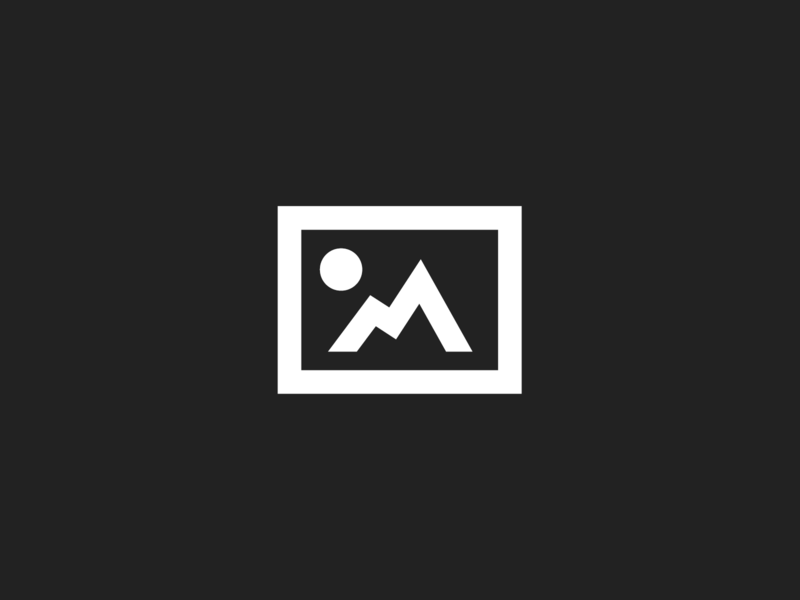 Harmless Cigarette is a proven method that helps thousands of people quit smoking every year. We are confident that you will find it helpful and useful for quitting, successfully quit smoking and become smoke-free for life! To learn more about Harmless Cigarette or for additional questions please visit the FAQ page or ask our support team available on live chat.